The initial layout of the game of Pyramid. From French pyramide, from Old French piramide, from Latin pȳramis, pȳramidis, from Ancient Greek πῡραμίς (pūramís), possibly from πῡρός (pūrós, “wheat”) + ἀμάω (amáō, “reap”) or from Egyptian pr-m-ws (“height of a pyramid”), from pr (“(one that) comes forth”) + m (“from”) + ws (“height”). An ancient massive construction with a square or rectangular base and four triangular sides meeting in an apex, such as those built as tombs in Egypt or as bases for temples in Mesoamerica. 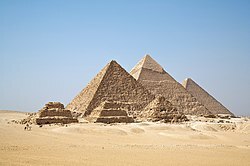 A construction in the shape of a pyramid, usually with a square or rectangular base. [T]he owners of Doddington Hall, in Lincolnshire, have brought the folly into the 21st century, by building a 30ft pyramid in the grounds of the Elizabethan manor. (geometry) A solid with triangular lateral faces and a polygonal (often square or rectangular) base. (Britain, dated) The game of pool in which the balls are placed in the form of a triangle at spot. (card games) The triangular layout of cards in the game of Pyramid. Build your pyramid with all cards face down, except the cards in the bottom row. For quotations of use of this term, see Citations:pyramid. (transitive, genetics) To combine (a series of genes) into a single genotype. (intransitive) To employ, or take part in, a pyramid scheme. This page was last edited on 24 March 2019, at 02:57.